Al-Qaeda in the Arabian Peninsula (Arabic: تنظيم القاعدة في جزيرة العرب‎, translit. Tanẓīm al-Qā‘idah fī Jazīrat al-‘Arab, lit. 'al-Qaeda Organization in the Arabian Peninsula' or تنظيم قاعدة الجهاد في جزيرة العرب‎, Tanẓīm Qā‘idat al-Jihād fī Jazīrat al-‘Arab, "Organization of Jihad's Base in the Arabian Peninsula"), or AQAP, also known as Ansar al-Sharia in Yemen (Arabic: جماعة أنصار الشريعة‎, Jamā‘at Anṣār ash-Sharī‘ah, "Group of the Helpers of the Sharia"), is a militant Islamist organization, primarily active in Yemen and Saudi Arabia. It was named for al-Qaeda, and states it is subordinate to that group and its now-deceased leader Osama bin Laden, a Saudi citizen of Yemeni heritage. It is considered the most active of al-Qaeda's branches, or "franchises," that emerged due to weakening central leadership. The U.S government believes AQAP to be the most dangerous al-Qaeda branch. The group established an emirate during the 2011 Yemeni Revolution, which waned in power after foreign interventions in the subsequent Yemeni Civil War. The group has been designated as a terrorist organization by the United Nations and several countries and international organizations. Since 2015, hundreds of AQAP members were recruited by militias backed by Saudi Arabia and the United Arab Emirates in the war against the Houthis. Like al-Qaeda Central, AQAP opposes the monarchy of the House of Saud. AQAP was formed in January 2009 from a merger of al-Qaeda's Yemeni and Saudi branches. The Saudi group had been effectively suppressed by the Saudi government, forcing its members to seek sanctuary in Yemen. In 2010, it was believed to have several hundred members. The group also seeks for the destruction of the Israeli state and the liberation of the Palestinian territories. U.S. Secretary of State Hillary Clinton formally designated al-Qaeda in Yemen a terrorist organization on December 14, 2009. On August 24, 2010, The Washington Post journalist Greg Miller wrote that the CIA believed Yemen's branch of al-Qaeda had surpassed its parent organization, Osama bin Laden's core group, as al-Qaeda's most dangerous threat to the U.S. homeland. On August 26, 2010, Yemen claimed that U.S. officials had exaggerated the size and danger of al-Qaeda in Yemen, insisting also that fighting the jihadist network's local branch remained Sanaa's job. A former bodyguard of Osama bin Laden warned of an escalation in fighting between al-Qaeda and Yemeni authorities, and predicted the government would need outside intervention to stay in power. al-Qaeda was responsible for the USS Cole bombing in October 2000 in the southern port of Aden, killing 17 U.S. sailors. In 2002, an al-Qaeda attack damaged a French supertanker in the Gulf of Aden. The Global Terrorism Database attributes the 2004 Khobar massacre to the group. In this guise, it is also known as "The Jerusalem Squadron." AQAP said it was responsible for Umar Farouk Abdulmutallab's attempted Christmas Day bombing of Northwest Airlines Flight 253 as it approached Detroit on December 25, 2009. In that incident, Abdulmutallab reportedly tried to set off plastic explosives sewn to his underwear, but failed to detonate them properly. On February 8, 2010, deputy leader Said Ali al-Shihri called for a regional holy war and blockade of the Red Sea to prevent shipments to Israel. In an audiotape he called upon Somalia's al-Shabaab militant group for assistance in the blockade. We will continue to strike blows against American interests and the interest of America's allies. ...since both operations were successful, we intend to spread the idea to our mujahedeen brothers in the world and enlarge the circle of its application to include civilian aircraft in the West as well as cargo aircraft. American authorities had said they believed that al-Qaeda in the Arabian Peninsula was behind the plot. Officials in the United Kingdom and the United States believe that it is most likely that the bombs were designed to destroy the planes carrying them. In November 2010, the group announced a strategy, called "Operation Hemorrhage", which it said was designed to capitalize on the "security phobia that is sweeping America." The program would call for a large number of inexpensive, small-scale attacks against United States interests, with the intent of weakening the U.S. economy. On 21 May 2012, a soldier wearing a belt of explosives carried out a suicide attack on military personnel preparing for a parade rehearsal for Yemen's Unity Day. With over 120 people dead and 200 more injured, the attack was the deadliest in Yemeni history. AQAP claimed responsibility for the attack. During the June 2012 al Qaeda retreat from key southern Yemen stronghold, the organization planted land mines, which killed 73 civilians. According to the governor's office in Abyan province, 3,000 mines were removed from around Zinjibar and Jaar. On 5 December 2013, an attack on the Yemeni Defense Ministry in Sana'a involving a series of bomb and gun attacks killed at least 56 people. After footage of the attack was aired on Yemeni television, showing an attack on a hospital within the ministry compound and the killing of medical personnel and patients, the head of al Qaeda in the Arabian Peninsula released a video message apologizing. Qasim al-Raymi claimed that the team of attackers were directed not to assault the hospital in the attack, but that one had gone ahead and done so. On 7 January 2015, Saïd Kouachi and Chérif Kouachi attacked French satirical newspaper Charlie Hebdo, resulting in 11 French citizens killed and another 11 injured. The French-born brothers of Algerian descent stated they were members of Al-Qaeda in Yemen, to an eyewitness. On 9 January, AQAP confirmed responsibility for the Charlie Hebdo shooting in a speech from top Shariah cleric Harith bin Ghazi al-Nadhari. The reason given was to gain "revenge for the honor" of the Islamic Prophet Muhammad. On 2 April 2015, AQAP fighters stormed the coastal city of Mukalla, capturing it on the 16th of April after the two-week Battle of Mukalla. They seized government buildings and used trucks to cart off more than $120 million from the central bank, according to the bank’s director. AQAP forces soon passed control to a civilian council, giving it a budget of more than $4 million to provide services to residents of the city. AQAP maintained a police station in the city to mediate Sharia disputes, but avoided imposing its rule across the city. AQAP refrained from using its name, instead using the name the 'Sons of Hadhramaut' to emphasize its ties to the surrounding province. Mukalla was recaptured by the Saudi-led coalition on 25 April 2016. In August 2018, Al Jazeera reported that a Saudi Arabian-led coalition "battling Houthi rebels secured secret deals with al-Qaeda in Yemen and recruited hundreds of the group's fighters. ... Key figures in the deal-making said the United States was aware of the arrangements and held off on drone attacks against the armed group, which was created by Osama bin Laden in 1988." On 2 December 2015, the provincial capital of Abyan Governorate, Zinjibar, and the town of Jaʿār were captured by AQAP fighters. Like Al Mukala, AQAP forces soon passed control to a civilian council, police patrols and other public services. On 20 February 2016, AQAP seized the southern Abyan governorate, linking them with their headquarters in Mukalla. In April 2011, Shaykh Abu Zubayr Adil bin Abdullah al-Abab, AQAP's chief religious figure, explained the name change as a re-branding exercise: "the name Ansar al-Sharia is what we use to introduce ourselves in areas where we work to tell people about our work and goals." In 2010 the White House was reported to be considering using the CIA's armed MQ-1 Predator drones to fight Al-Qaeda in Yemen. On September 30, 2011, a US drone attack in Yemen resulted in the death of Anwar al-Awlaki, one of the group's leaders, and Samir Khan, the editor of Inspire, its English-language magazine. Both were US citizens. Over the period 19–21 April 2014, a series of drone attacks on AQAP killed dozens of militants, and at least 3 civilians. A spokesperson for the Yemeni Supreme Security Committee described the attacks, which included elements of the Yemeni army as well as US drones, as "massive and unprecedented". The attacks were alleged to have targeted AQAP leadership, with a major AQAP base in Wadi al-Khayala reported to have been destroyed. Nasir al-Wuhayshi, former leader and founder of AQAP, was killed by a drone strike in June 2015. Founder and former Emir of AQAP. Deputy Emir and General Manager of al-Qaeda. Killed in a drone strike in June 2015. Senior military commander in AQAP. In 2007, he and AQAP leader Nasir al-Wuhayshi announced the emergence of al-Qaida in Yemen, AQAP’s predecessor group. He played an important role in recruiting the current generation of militants making up the Yemen-based AQAP. Deputy Emir and highest ranking Saudi official in AQAP. Was a former detainee at Guantanamo Bay until released to Saudi Arabia in November 2007. Killed in a drone strike in 2013. He played an important role during the AQAP battles in the Abyan province. Succeeded by his brother Tawfiq Bala'idi. Killed in a drone strike on February 4, 2016. Surrendered to Saudi authorities in Yemen in February 2009. Led jihadist fighters in their takeover of Yemen's Abyan Governorate in 2011, where he was accorded the position of emir. Current senior military strategist and commander for AQAP forces in Hadhramaut Governorate and coordinated AQAP forces in the Battle of Mukalla. He was reported to be AQAP's mufti. Detaineed at Guantanamo Bay until December 2006 when he was handed over to Saudi Arabian authorities, he subsequently escaped to Yemen. Killed in a drone strike in April 2015. He claimed responsibility for the Charlie Hebdo shooting on behalf of AQAP. Senior recruiter and involved in organizing external operations to be conducted for AQAP. Killed in a drone strike in September 2011. He rebuked the Islamic State announcement of expanding their caliphate into Yemen and renewed loyalties to al-Qaeda and its leader, Ayman al-Zawahiri. Killed in a drone strike in January 2015. Has served as AQAP's chief of security. He is a founding member of AQAP and provides military and security guidance to the AQAP leadership. He was added to the U.S. State Department's Rewards for Justice list on October 19, 2014. Wanted by the United States for his involvement in the USS Cole bombing in Aden, Yemen on October 12, 2002. Killed in a drone strike in May 2012. Played a key role in a plan for a major attack in summer 2013 that led the United States to close 19 diplomatic posts across the Middle East and Africa. Killed in a drone strike in November 2014. Killed in a drone strike in Yemen in February 2015. In March 2016, the State Department confirmed to The Bureau of Investigative Journalism that al-Ghamdi no longer "posed a threat to U.S. persons or interests." AQAP confirmed al-Ghamdi's death in September 2018.
al-Asiri was the chief bomb-maker and weapons specialists for AQAP. Presumed dead following a drone strike in late 2017. The group has taken advantage of Yemen's "slow collapse into near-anarchy. Widespread corruption, growing poverty and internal fragmentation have helped make Yemen a breeding ground for terror." More than two years later, on April 25, 2012, a suspected US drone strike killed Mohammed Said al-Umdah, a senior AQAP member cited as the number four in the organization and one of the 2006 escapees. He had been convicted of the 2002 tanker bombing and for providing logistical and material support. Reportedly, as many as 20 Islamist British nationals traveled to Yemen in 2009 to be trained by AQAP. In February 2012, up to 500 Internationalistas from Somalia's Al Shabaab, after getting cornered by a Kenyan offensive and conflict with Al Shabaab national legions, fled to Yemen. It is likely that a number of this group merged with AQAP. The following is a list of people who have been purported to be AQAP members. Most, but not all, are or were Saudi nationals. Roughly half have appeared on Saudi "most wanted" lists. In the left column is the rank of each member in the original 2003 list of the 26 most wanted. Khaled bin Ibrahim Mahmoud خالد بن إبراهيم محمود called "Baghdadi"
Hazem Mohammed Saeed حازم محمد سعيد called "Kashmiri"
^ a b c d "Al-Qaeda in the Arabian Peninsula: who are they?". Channel4 News. Archived from the original on 4 November 2010. Retrieved November 12, 2010. ^ a b c "Al-Qaeda in the Arabian Peninsula (AQAP)". Counter Extremism Project. Retrieved 23 April 2015. ^ a b [ Dana Ford, CNN (15 June 2015). "Top al Qaeda leader reported killed in Yemen". CNN. Retrieved 16 June 2015. ^ a b c "Al Qaeda in Yemen says leader killed in U.S. bombing". Reuters. 16 June 2015. Retrieved 10 February 2017. ^ a b c d e f "S/2018/705 - E". undocs.org. ^ "Al Qaeda prepares 'an army of 12,000 fighters,' threatens security forces - FDD's Long War Journal". ^ "Al Qaeda forms army of 12,000 fighters in Yemen". ^ "AQAP announces formation of 12,000-strong army. Again. - FDD's Long War Journal". ^ "Chapter 6. Foreign Terrorist Organizations". ^ Seldin, Jeff. "Flexing New Authorities, US Military Unleashes Barrage on AQAP". ^ "AP Investigation: US allies, al-Qaida battle rebels in Yemen". AP News. ^ "Yemen bomb: Suicide bomber hits military parade in Sanaa". GlobalPost. 20 May 2012. Retrieved 14 November 2013. ^ "The Paris Attacks Underscore the Deep Threat Still Posed by Al Qaeda". January 10, 2015. Retrieved 11 February 2017. ^ Phillips, James; Siegel, Josh (20 September 2014). 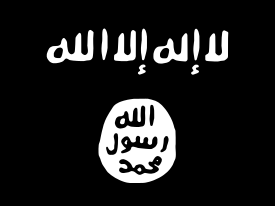 "Q&A: Meet Khorasan, the Terrorist Group That Might Be Scarier Than ISIS". The Daily Signal. Heritage Foundation. Retrieved 19 October 2014. ^ "الجيش واللجان الشعبية يطهرون معسكر لبوزة من عناصر القاعدة في لحج - أنصار الله". www.ansarollah.com. ^ "Gulf Coalition Targeting AQAP in Yemen". ^ "The prince of counterterrorism: The story of Washington's favorite Saudi, Muhammad bin Nayef". ^ "Yémen: l'armée, aidée par les Etats-Unis, progresse face à Al-Qaïda". Le Point. 21 July 2011. Retrieved 10 February 2017. ^ a b "Al-Qaeda in the Arabian Peninsula Rejects Isis 'Caliphate', Ending Fears of Deadly Terror Alliance". International Business Times. 21 November 2014. ^ "In Yemen chaos, Islamic State grows to rival al Qaeda". Reuters. 30 June 2015. ^ "Al-Qaeda dispute with Isis devolves to name-calling". The Independent. 3 November 2015. ^ a b c "Terrorist Designations of Ansar al-Sharia as an Alias for Al-Qaida in the Arabian Peninsula". Department of State. Retrieved 26 June 2014. ^ "Al-Qaeda's Yemen branch eyes a new haven". The Washington Post. 8 August 2013. Retrieved 23 April 2015. ^ "Al-Qaeda in the Arabian Peninsula (AQAP) – Council on Foreign Relations". Cfr.org. Retrieved 2012-06-04. ^ "The al-Qaeda Brand Died Last Week". Forbes. September 6, 2011. Retrieved September 7, 2011. ^ "AP Investigation: US allies, al-Qaida battle rebels in Yemen". ^ a b c d "FACTBOX-Al Qaeda's Yemen-based wing". Reuters. 8 November 2010. Retrieved November 8, 2010. ^ Novak, Jane (January 26, 2009). "Arabian Peninsula al Qaeda groups merge". Long War Journal. Archived from the original on 11 February 2010. Retrieved January 27, 2010. ^ Wong, Kristina (January 5, 2010). "Yemen: 'Major Staging Base' for Al Qaeda: Q and A With Former CIA Official and Al Qaeda Expert Bruce Riedel". ABC News. Archived from the original on 10 January 2010. Retrieved January 27, 2010. ^ Gerstein, Josh (January 18, 2010). "Clinton named Al-Qaeda Yemen as terror group a month ago". Politico.Com. Retrieved April 8, 2010. ^ Greg Miller (August 24, 2010). "CIA sees increased threat in Yemen". Retrieved April 28, 2014. ^ Al Arabiya News (26 August 2010). "Yemen says US officials exaggerate Qaeda threat". Retrieved 10 February 2017. ^ FoxNews (August 26, 2010). "Bin Laden's Bodyguard Warns Escalation in Yemen". Fox News Channel. Retrieved March 8, 2014. ^ "Incident Summary 200405290002". Global Terrorism Database. May 29, 2004. Archived from the original on January 16, 2010. Retrieved January 1, 2010. ^ "The Advent Of Terrorism In Qatar". Forbes. March 25, 2005. Archived from the original on January 16, 2010. ^ Dao, James (January 21, 2010). "Man Claims Terror Ties in Little Rock Shooting". The New York Times. Archived from the original on 25 January 2010. Retrieved January 22, 2010. ^ Mike Phelan; Mike Mount; Terry Frieden (June 1, 2009). "Suspect arrested in Arkansas recruiting center shooting". CNN. Retrieved March 25, 2010. ^ Dao, James (February 16, 2010). "A Muslim Son, a Murder Trial and Many Questions". The New York Times. Arkansas;Yemen. Retrieved June 23, 2010. ^ "Detroit terror attack: al-Qaeda regional group claims responsibility". The Daily Telegraph. London. December 28, 2009. Archived from the original on January 16, 2010. ^ "Yemen: Qaeda Affiliate Urges Joint Blockade of Red Seas". The New York Times. New York. February 9, 2010. Archived from the original on 11 February 2010. Retrieved February 9, 2010. ^ a b "Yemen-based al Qaeda group claims responsibility for parcel bomb plot". CNN. 6 November 2010. Archived from the original on 13 November 2010. Retrieved November 8, 2010. ^ Updated 22 minutes ago 11/8/2010 12:24:00 PM +00:00. "Al-Qaida claims responsibility for cargo bombs". MSNBC. Archived from the original on 7 November 2010. Retrieved November 8, 2010. ^ Entous, Adam (5 November 2010). "Yemeni al Qaeda Claims Package Bomb Attempts". The Wall Street Journal. Retrieved November 8, 2010. ^ "Yemeni Al Qaeda Group Claims Responsibility for Failed Mail Bomb Plot on U.S. Cargo Planes". Fox News Channel. Associated Press. April 7, 2010. Archived from the original on 8 November 2010. Retrieved November 8, 2010. ^ Mazzetti, Mark; Worth, Robert F.; Lipton, Eric (31 October 2010). "Bomb Plot Shows Key Role Played by Intelligence". The New York Times. ^ "Yemen group vows small-scale attacks". CBC News. 21 November 2010. ^ Jane Ferguson (21 May 2012). "In Yemen, a ruthlessly symbolic attack". Al Jazeera. Retrieved 20 May 2012. ^ "Al-Qaeda claims deadly Yemen suicide blast". Al Jazeera. 21 May 2012. Retrieved 20 May 2012. ^ a b "Yemen says al Qaeda land mins killed 73 this week". The Examiner. 2012-06-27. ^ "Militants attack hospital at Yemen's Defense Ministry". CNN. December 5, 2013. Retrieved 2013-12-06. ^ "Al Qaeda: We're sorry about Yemen hospital attack". CNN. 2013-12-22. Retrieved 2014-01-22. ^ "Yemen soldiers killed near Sanaa presidential palace". BBC. 9 May 2014. Retrieved 9 May 2014. ^ "Pentagon confirms failed effort to rescue Somers". The Seattle Times. 4 December 2014. Retrieved 10 February 2017. ^ "Terrorists shouted they were from Al Qaeda in the Yemen before Charlie Hebdo attack". The Daily Telegraph. 7 January 2015. Retrieved 7 January 2015. ^ "Al-Qaeda Group Claims Responsibility for Paris Terror Attack". 9 January 2015. Retrieved 11 February 2017. ^ "Al Qaeda Tries a New Tactic to Keep Power: Sharing It". The New York Times. 9 June 2015. Retrieved 12 August 2015. ^ "#YEMEN Pro-#AQAP's #AlMasra Newspaper Slams #WhiteHouse Chief Strategist #SteveBannon. #TerrorMonitor". Twitter. Terrormonitor.org. 27 February 2017. Retrieved 27 February 2017. ^ "New issue of Anṣār al-Sharī'ah in the Arabian Peninsula's newspaper: "al-Masrā #41"". Jihadology. February 27, 2017. ^ "Report: Saudi-UAE coalition 'cut deals' with al-Qaeda in Yemen". Al-Jazeera. 6 August 2018. ^ "US allies, Al Qaeda battle rebels in Yemen". Fox News. 7 August 2018. ^ "Allies cut deals with al Qaeda in Yemen to serve larger fight with Iran". San Francisco Chronicle. 6 August 2018. ^ Mohammed Mukhashaf (2 December 2015). "Al Qaeda militants take over two south Yemen towns, residents say". Reuters. Retrieved 12 May 2016. ^ AFP (20 February 2016). "Qaeda kills three in sweep of Yemen's south". Retrieved 12 May 2016. ^ "Yemeni army claims major advance in campaign against al Qaeda". Reuters. Retrieved 1 August 2015. ^ "Know Your Ansar Al Sharia". Foreign Policy. 2012-09-21. Retrieved 2014-01-22. ^ "Yemen rejects U.S. role in fighting al-Qaida". Xinhua News Agency. Retrieved October 31, 2010. ^ "Laura QUADARELLA SANFELICE DI MONTEFORTE, Il terrorismo "fai da te". Inspire e la propaganda online di AQAP per i giovani musulmani in Occidente, Aracne Editrice, Roma, 2013". ^ "Two U.S.-Born Terrorists Killed in CIA-Led Drone Strike". Fox News Channel. 30 September 2011. Archived from the original on 30 September 2011. Retrieved 30 September 2011. ^ MUKHASHAF, MOHAMED (20 April 2014). "Air strikes in Yemen kill 40 al Qaeda militants in two days". Reuters. Retrieved 22 April 2014. ^ "Third suspected US drone strike kills 'several' al-Qaida militants". The Guardian. 21 April 2014. Retrieved 22 April 2014. ^ "Drone strikes alone won't stamp out al Qaeda in Yemen — analysts". Reuters. 21 April 2014. Retrieved 22 April 2014. ^ "Three suspected militants killed in Yemen drone strike". BBC. 21 April 2014. Retrieved 22 April 2014. ^ Raddatz, Martha (21 April 2014). "After Celebratory Video, Al Qaeda Pounded By Deadly Airstrikes". abc news. Retrieved 22 April 2014. ^ Jamjoom, Mohammed; Smith, Matt (21 April 2014). "Yemen strikes may target top al Qaeda leaders". CNN. Retrieved 22 April 2014. ^ "Yemen said strikes on al-Qaida base in southern mountains kill 55 militants". U.S. News. 21 April 2014. Retrieved 10 February 2017. ^ "Accelerating Yemen campaign, U.S. conducts flurry of strikes targeting al-Qaeda". ^ "Targeting AQAP: U.S. Airstrikes in Yemen". ^ "US military hits AQAP with more than 20 airstrikes - FDD's Long War Journal". ^ "Analysis: Osama bin Laden's son praises al Qaeda's branches in new message - FDD's Long War Journal". ^ "AQAP's emir also serves as al Qaeda's general manager". The Long War Journal. Retrieved 12 May 2016. ^ "Yemen says 6 al Qaeda leaders killed". CNN. January 15, 2010. Retrieved January 16, 2010. ^ [dead link] "2 tourists dead in attack in Yemen". International Herald Tribune. 18 January 2008. Archived from the original on 21 January 2008. Retrieved 18 January 2008. ^ a b "Qasim al-Rimi". Retrieved 11 February 2017. ^ Gregory D. Johnsen (2012-07-24). "A Profile of AQAP's Upper Echelon". Combatting Terrorism Center. Retrieved 2013-04-26. As the deputy commander and highest-ranking Saudi in AQAP, al-Shihri played a key role in recruiting other Saudis and fundraising in the kingdom. In late 2009, a cell phone video of al-Shihri surfaced in which he made a plea for money from wealthy Saudi donors. In an effort to avoid detection the video never left the phone on which it was recorded. Instead, an AQAP courier traveled throughout Saudi Arabia showing the video message to different individuals. ^ Worth, Robert F. (22 January 2009). "Freed by U.S., Saudi Becomes a Qaeda Chief". New York Times. Retrieved 23 September 2016. ^ SITE. "AQAP Concludes Biography of Slain Deputy Leader in 3rd Episode of Series — Jihadist News". Retrieved 22 March 2015. ^ "Amid Yemen chaos, al Qaeda stages prison break". CBS News. 2 April 2015. Retrieved 9 April 2015. ^ Spencer, Richard (4 April 2015). "The al-Qaeda commander at home in a governor's palace". The Telegraph. Retrieved 9 April 2015. ^ Bacchi, Umberto (4 April 2015). "Yemen: Al-Qaeda operative Khalid Batarfi takes selfies inside Mukalla government". International Business Times. Retrieved 9 April 2015. ^ "List of Individuals Detained by the Department of Defense at Guantanamo Bay, Cuba from January 2002 through May 15, 2006" (PDF). United States Department of Defense. 2006-05-15. Archived from the original (PDF) on 2007-06-16. Retrieved 2006-05-15. ^ "Ibrahim al-Rubaysh". 2013. Archived from the original on 2017-02-02. Retrieved 11 February 2017. ^ "Former GITMO detainee now al-Qaida brass". United Press International. 2009-12-04. Archived from the original on 2009-12-06. Retrieved 2009-12-05. ^ "Yemen al-Qaida branch says top cleric killed in drone attack". Associated Press. 14 April 2015. Archived from the original on 15 April 2015. ^ "Osama bin Laden's Files: Al Qaeda's deputy general manager in Yemen". Long War Journal. March 2015. Retrieved 11 February 2017. ^ Aboudi, Sami (14 January 2015). "Al Qaeda claims French attack, derides Paris rally". Reuters. Retrieved 15 January 2015. ^ Dana Ford (7 May 2015). "Senior AQAP leader Nasr Ibn Ali al-Ansi killed". CNN. ^ Cardona, Felisa (December 3, 2009). "U.S. attorney defends dropping radical cleric's case in 2002". The Denver Post. Retrieved December 7, 2009. ^ "Boston Marathon Bombers Inspired By Anwar al-Awlaki". Anti-Defamation League. ^ a b "Getting to Know al-Qaeda – Part II: AQAP". October 2012. Retrieved 11 February 2017. ^ "Islamist cleric Anwar al-Awlaki 'killed in Yemen'". BBC News. 30 September 2011. Retrieved 15 April 2015. ^ "AQAP says senior leader killed in drone strike". February 2015. Retrieved 11 February 2017. ^ a b "Ibrahim al-Banna". Retrieved 11 February 2017. ^ "Rewards for Justice — Reward Offers for Information on Al-Qaida in the Arabian Peninsula (AQAP) Leaders". U.S. Department of State. Archived from the original on 2015-03-17. Retrieved 22 March 2015. ^ "Rewards for Justice — Wanted". Retrieved 22 March 2015. ^ "An al Qaeda commander comes out from the shadows - FDD's Long War Journal". FDD's Long War Journal. ^ a b "Othman al-Ghamdi". Archived from the original on 2017-02-02. Retrieved 11 February 2017. ^ الحياة (8 February 2015). "مقتل سعوديين في داعش وآخر قيادي في القاعدة في اليمن وسوريا". ^ "Rewards for Justice - Wanted for Terrorism". Retrieved 12 May 2016. ^ "Yemen: Reported US covert actions 2016". The Bureau of Investigative Journalism. Retrieved 12 May 2016. ^ Abdullah Al-Oreifij (September 1, 2009). "Suicide bomber named". Saudi Gazette. Archived from the original on September 1, 2009. Retrieved August 2, 2009. ^ "Profile: Al-Qaeda 'bomb maker' Ibrahim al-Asiri". BBC News. 4 July 2014. Retrieved 10 February 2017. ^ Martin, David (August 20, 2018). "U.S. officials confident drone strike killed chief al Qaeda bomb maker". CBS News. Retrieved August 21, 2018. ^ Palahniuk. "AQAP Official Urges Fighters in Syria Unite to Attack Israel, Warns U.S. of New Breed of Fighter - Statements - Jihadist News - Articles". ^ Joscelyn, Thomas. "Ex-Guantanamo detainee now an al Qaeda leader in Yemen". Long War Journal. Long War Journal. Retrieved 10 December 2015. ^ Adrian Blomfield; Duncan Gardham (January 3, 2010). "Britain and US close embassies in Yemen over fears of imminent attack from al-Qaeda". The Daily Telegraph. London. Archived from the original on January 16, 2010. ^ "Yemen army recaptures center of al-Qaida-held city". Associated Press. January 16, 2010. Archived from the original on July 3, 2015. Retrieved April 25, 2012. ^ a b "Long Island Arrest Highlights Continuing Lure Of Terror Groups Abroad". Access ADL. Anti-Defamation League. Retrieved 2013-10-21. ^ Sean Rayment; Adrian Blomfield; Richard Spencer; Philip Sherwell (January 3, 2010). "Detroit terror attack: Britain sends counter-terrorist forces to Yemen". The Daily Telegraph. London. Archived from the original on January 16, 2010. ^ "CTC Sentinel — Combating Terrorism Center at West Point" (PDF). Archived from the original (PDF) on 25 January 2011. Retrieved 22 March 2015. ^ ""Bitter School Dropout Who Became a Flamboyant Killer" by Rob L. Wagner, ''Saudi Gazette'', June 20, 2004". Google. 2004-06-20. Retrieved 2012-06-04. ^ "Battle of Al-Ras" by Sabria S. Jawhar and Rob L. Wagner, Saudi Gazette, April 12, 2005. Google.com (2003-05-12). Retrieved 2011-12-29. ^ Islam Today report of mediation in the surrender of Othman al-'Amri. The mediator was Safir al-Hawali; see Salman al-Ouda. ^ Royal Crackdown Archived February 5, 2012, at the Wayback Machine, by John Walsh, Harvard International Review, Fall 2003; about Turki al-Dandani. Details are at present available only in Arabic. ^ Maggie Michael (January 23, 2009). "Report: Ex-Gitmo Detainee Joins Al-Qaida in Yemen". ABC News. Archived from the original on October 24, 2009. ^ Vikås, Marianne; Coombs, Casey L.; Johnsrud, Ingar; Akerhaug, Lars; Tom Bakkeli (2012-07-02). "none". Verdens Gang (in Norwegian). p. 12. ^ Leon Watson (2012-06-26). "Norwegian man trained by Al Qaeda in Yemen is planning an attack on the West, say security forces". Daily Mail. Retrieved 2012-10-09. Johnsen, Gregory (2012). The Last Refuge: Yemen, al-Qaeda, and America's War in Arabia, Scribe, Melbourne. ISBN 9781922070012. Wikimedia Commons has media related to AQAP. "Al-Qaeda in the Arabian Peninsula collected news and commentary". The New York Times.